I can pass up an entire tray of brownies, no problem. Cake? No thanks. Cookies? Blah. Not interested. But put a plate of French fries in front of me, and I become a ravenous fiend. I crave salty, fatty foods. And much like the folks on the sweet tooth side of the fence, my cravings can tax my diet, big time. So when I have a hankering for something salty, I have to strategize to avoid a major pitfall. Whatever I choose to eat has to satisfy my junk food cravings, but not derail my efforts to eat healthy. Fortunately, our forte in the EatingWell Test Kitchen, where I test and develop recipes, is taking unhealthy foods and making healthier versions of them. So I have plenty of options for swapping out the bad foods for better ones while satisfying my yearning for junk food. Onion Rings: Who doesn’t love onion rings? I’ll save 235 calories and 21 grams fat if I avoid the Hardee’s down the street and oven fry them myself at home. Chips: You don't need a deep fryer to make crispy potato chips. 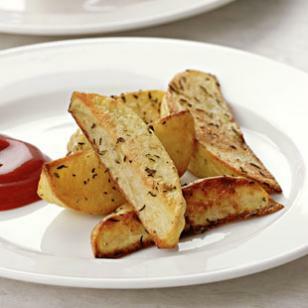 You can toss thinly sliced potatoes with just a touch of olive oil, pop them in the microwave and voilá! Crispy, crunchy homemade potato chips with 8 grams less fat per serving than regular chips. Fried Chicken Strips: I lust over chicken strips. But if I make chicken tenders at home, I’ll save 158 calories and 16 grams fat over the order I would have chowed down on at Arby’s. Healthier Recipe to Make At Home: BBQ Chicken Tenders. Fries: Who said French fries have to be fried? Our Oven Fries make a great appetizer or side dish and come in at 278 calories and 14 grams less fat than their deep-fried counterpart. Enough said.